Assistant groundskeeper Jeremy Atkins edges the warning track at Coca-Cola Field on Monday. The recent snow didn’t help, but with warmer temperatures coming, the field is expected to be ready to go. See a photo gallery at BuffaloNews.com. The Bisons players are here. Now, the big question is: Will the field be ready for Thursday’s season opener? Last weekend’s snowfall was the latest weathery curveball change of pace thrown Coca-Cola Field’s way. 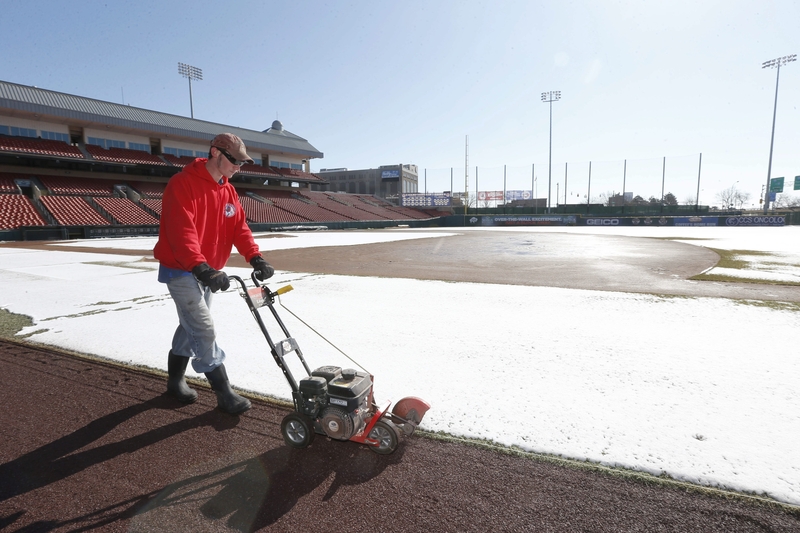 But warmer temperatures expected for the area over the next few days – coupled with a new drainage system installed after the 2010 season – hold out the promise for a beautiful Opening Day, when the International League’s Buffalo Bisons take the field at 2 p.m. Thursday against the Rochester Red Wings. “The warmer temperatures today and (Wednesday) are really going to help in softening the ground and getting that moisture down to that drainage system, so it can drain on out,” said Bisons spokesman Brad Bisbing. As the grounds crew tended to the field, other workers installed one of the two new LED message boards, located on the facing of the second deck along the third-base line. Also new are 120 speakers placed strategically throughout the stadium – a departure from the sound booming from behind the centerfield scoreboard, 400 feet from home plate. Another sign that baseball is in the air was the arrival of bats boxed for delivery – marked with player names or “Louisville Slugger.” Also delivered were team jerseys, batting helmets and exercise equipment. The shipment arrived on a bus from Dunedin, Fla., the spring training headquarters for the Bisons parent club, the Toronto Blue Jays. Led by new manager Gary Allenson, the Herd’s 25-man roster will feature 16 players who made it to the Major Leagues last season. They’re expected to be led by first-time Bison Dan Johnson, the International League MVP in 2010; Kevin Pillar, who earned the Blue Jays’ Webster Award in 2013 as the club’s top minor league player; and highly regarded pitching prospects Marcus Stroman and Sean Nolin.